In 1867, George Farmer of Flint, Michigan, patented a tallying instrument (US patent 69647). The patent model of the device (up to 1880, the US Patent Office required inventors to submit a model with their patent application) is still preserved in the National Museum of American History, Washington, D.C. (see the image below). 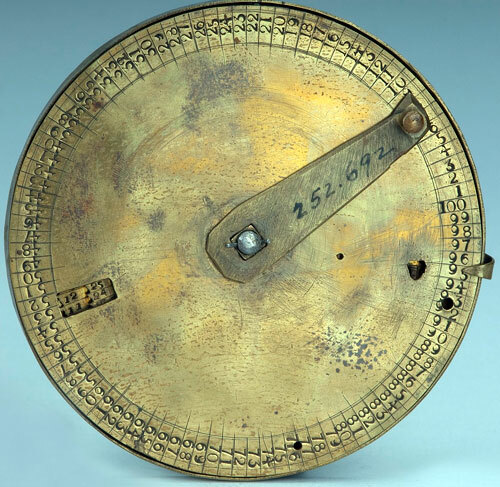 The tallying instrument of George Farmer is a circular brass adding device with overall measurements: 1.2 cm x 10.7 cm x 10.7 cm. The case, the dial-plate and wheels are made of metallic sheet metal. The instrument of George Farmer has three concentric, linked discs that revolve on a central pivot. The bottom disc is numbered from 1 to 99 clockwise around its toothed edge, to represent hundreds and thousands. Above it is a smaller disc, also with teeth around the edge, numbered from 00 to 99 clockwise to represent units and tens. A window in the third, top, largest disc shows the result on the dials below. The largest disc (a dial-plate) is numbered from 1 to 100 around the edge. Atop the dial-plate is a rotating lever (arm), which traverses the disk, and by which the instrument is operated. Moving the arm counterclockwise advances the inner disc proportionally, allowing the operator to enter numbers up to 99. Another lever extends from the side of the disc and bends over the top, performing the carry, if needed. If the arm rotates around a full 100 units, it pushes this lever, causing a carry. The lever also may be used to zero the hundreds and thousands digits. Who was the inventor George Farmer? George Farmer was born in 1830 in England and immigrated into the US in 1850s. He initially established in Illinois (Elmira and Osceola), working as a miller. In Osceola, IL, in 1860 he received a patent for a reaper or harvester (US29685). In 1860s, he moved to Michigan (Flint and Saginaw), still working as a miller. In 1870s he and his son, Albion, established a shingle-making business in Saginaw, MI, under the name of George Farmer & Son. George Farmer died (of cerebral hemorhage) on June 24, 1880, in Saginaw, Michigan.